After several months of hard work, we were able to bring the second issue of By The Bottle to iPad and iPhone users just a couple of weeks ago. If you haven’t downloaded it yet, I implore you to give it a try. And if you are a Mandarin speaker, you’re in luck because our latest issue is bilingual. When viewed in portrait mode, it shows the English version. Turn your device to landscape mode and it is in Mandarin. In the latest issue we have upped the ante a little by not only publishing informative articles from wine experts like Gus McLean, Ben Grosvenor and Joss Fowler (Gus writes about carmenere from Chile, Ben gives us the lowdown on what tannins are all about and Joss discusses why the world’s most expensive wines are worth the only), but we also have a how-to guide on wearing colourful trousers, the dos and don’ts of visiting a wine shop and so much more. 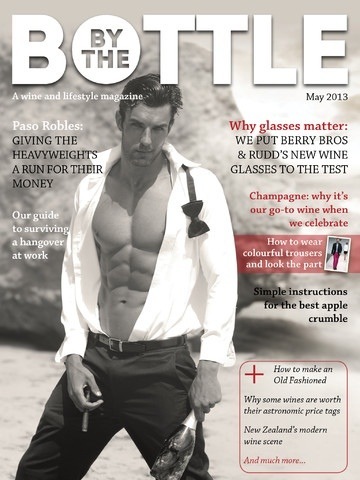 This magazine is about enjoying wine and having fun, and we hope we have achieved that. We have some lighthearted pieces that should bring a smile to your face, but we know how to be serious and informative as well. Ever wondered if there is a discernible difference between the way wine tastes out of two different glasses? We have it covered. Ever been curious about New Zealand’s wine scene? Kat Wiggins gives us her first-person account. And have you ever wanted to know how to make an Old Fashioned or the best crumble? Look no further. If you think we’re missing something, let us know. Is the content not up to snuff? Do you want to read about something specific? Your feedback will allow us to tailor the magazine to your needs. Okay, that’s my spiel over. I will resume usual service shortly. Soon to come will be a blog about the wineries of the Okanagan Valley.